Earned value is a very powerful tool for monitoring the health of any project. In less than 700 words, here's why you should be using it. Let's say you want to develop a new product and it will take a team of 20 ten months to develop the product. 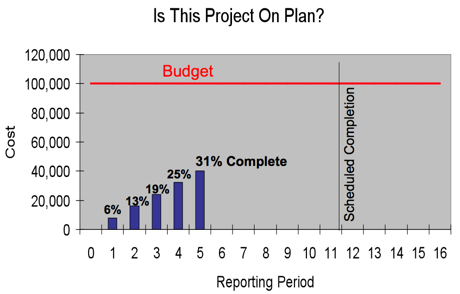 You don't usually use earned value to monitor your projects, so the ten months you have budgeted includes an allowance to cover typical delays that studies show are bound to occur. If you could prevent a delay of just 10%, the product could be launched one month sooner. This would reduce your development costs by one month's worth of labor and allow you to start generating revenue one month sooner. If earned value could deliver that benefit, shouldn't it be used to measure the health of all your projects? If this project continues on its current path, it will go 28% over-budget and 33% beyond its target completion date. The chart won't show this for another few months when the trend becomes more obvious. If however, you had been tracking the schedule and budget performance indexes (SPI & CPI), you would have suspected in the second month that there may be a problem. The CPI and SPI have not changed since the first month. They have both been below .80 every month. In fact, if the CPI doesn't change, neither will the forecast at completion. It will continue to be the same every month: $28,000 over-budget. It was probably too early to take any action on this information in the second month when an unfavorable performance trend was only emerging, but, by the fifth month, there is some writing on the wall that at least calls for an investigation. Consider a different situation where CPI and SPI are favorable but trending down like the example below. The goal of this project was to upgrade an online ordering system without stopping the flow of over $250 million in annual business to business revenue for an office supplies company. A quick review of the CPI and SPI for the major tasks on this project revealed that there was one task that accounted for the entire downward trend in cost performance and that this task in combination with another accounted for the entire downward trend in schedule performance. After the project manager spoke to the players involved, he learned that there was effort being logged against a task that required new hardware which the customer had not yet provided. He also learned that the progress of the coding resources was slowing because the customer was behind on user testing. The project manager was able to re-focus the resources and warn the customer that it was risking cost overruns and delays if it didn't act. Given his hectic schedule and long list of other responsibilities, delays on this project would certainly have occurred if this project manager had not used earned value tracking methods. Neither would he have been able to inform the customer early enough to avoid a conflict over who caused a delay in completion of the project. The sooner you know of a potential issue, the greater the chance you have of acting to remove its unfavorable impact. Earned value uncovers emerging issues in time to minimize their impact. We can't avoid issues on projects, but by minimizing their impact, we can dramatically improve the odds of eliminating delays and cost overruns. 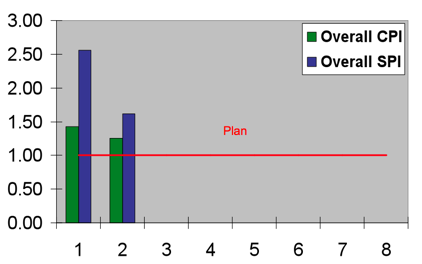 Eliminating a mere 10% in typical delays is the least you should expect from earned value. Can you afford not to deliver this benefit to your organization? Written by Shawn Nisenboim of Indigo Technologies. This article was originally published in the Project Times magazine, Fall 2003 issue. For more information about how you can take advantage of Earned Value methods for your projects e-mail us at sales@indigo1.com.